The Adventure Cycling Association has focused its most recent efforts on creating bicycle travel routes that highlight areas of historical and cultural significance. Past results include the Lewis & Clark Trail and the hugely popular Underground Railroad Bicycle Route (which passes by the Century Cycles stores in both Medina and Peninsula). 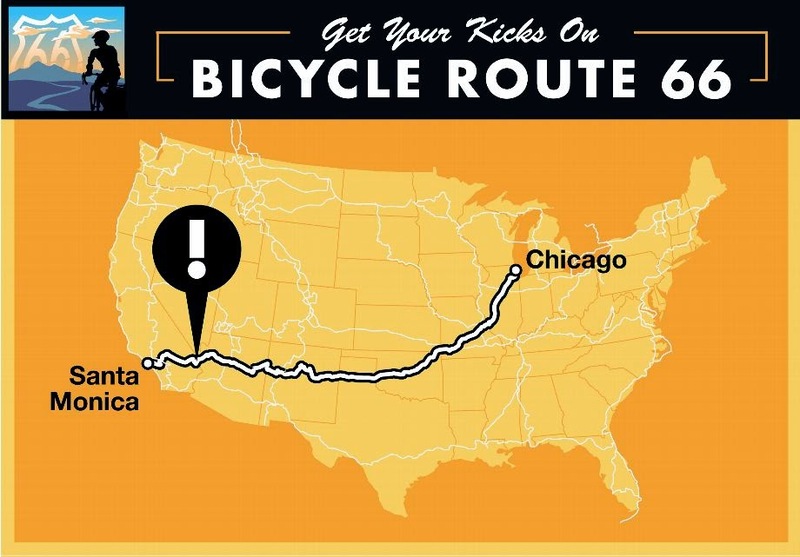 Their latest project is Bicycle Route 66, which follows the original route of the historic "Mother Road" from Chicago, Illinois to Santa Monica, California. However, the completion of this route in time for publication this spring is in jeopardy. ACT NOW - BY FEB. 1! Please ask the California Department of Transportation (Caltrans) to allow bicycle access on I-40 between Needles and Barstow, California. Bicycle travelers currently do not have legal access to bicycle this 144-mile section of Adventure Cycling’s Bicycle Route 66. Without I-40 access, cyclists will have to end their trip early (at the California border) or risk being ticketed by illegally riding the interstate. The Bicycle Route 66 maps are going to print in early February, and your voice will help put pressure on Caltrans to resolve this urgent issue now. See first-hand the road conditions on the National Trails Highway -- the only other route option which is currently closed and sections are unsuitable for bicycling. Please email the following Caltrans decision-makers by February 1st. With this statement in mind, we strongly recommend that Caltrans take the appropriate steps to ensure cyclists have a safe and legal route for Bicycle Route 66. Since the National Trails Highway is currently closed and sections are in extremely poor condition, I-40 provides the best and only continuous route for Bicycle Route 66 between Needles and Barstow, CA. Cyclists will come from across the world to ride Bicycle Route 66, bringing their appetites and pocketbooks with them. Studies indicate that bicycle travelers spend between $76 and $114 per day and stay in a region longer than motorized tourists. This can have a significant impact on the rural communities of San Bernardino County over time. As a supporter/member of Adventure Cycling, I urge Caltrans take the steps necessary to make bicycle access legal on I-40 between Needles and Barstow, CA so I and others like me can travel by bicycle through California. P.S. Thank you for your kind attention to this email Malcolm Dougherty, Basem Muallem and Catalino Pining III. We are hopeful that with your support, we can make Bicycle Route 66 a better route now and in the future.